LAWRENCE, Kan. – A 14-0 second-half run along with a 29-point, 15-rebound outing from redshirt-junior Dedric Lawson lifted the No. 9/10 Kansas Jayhawks past the No. 24/25 Iowa State Cyclones, 80-76, Monday night inside Allen Fieldhouse. Senior Lagerald Vick and sophomore Marcus Garrett combined for 22 second-half points, while freshman Devon Dotson chipped in 11 points to go along with a career-high eight assists in the win. The victory, which improved the Jayhawks to 88-11 under Bill Self when coming off a loss, moved Kansas to 16-3 in the 2018-19 season and 5-2 in the Big 12. Iowa State dropped to 14-5 in its season and fell to 4-3 in the league. 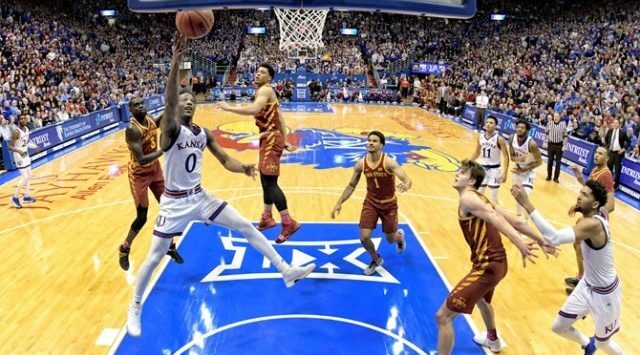 Trailing by six points with just under 13 minutes remaining in regulation, the Kansas Jayhawks put together a six minute spurt that proved to be too much for the Cyclones to overcome. After ISU’s Talen Horton-Tucker connected on his fourth 3-pointer of the night to push his team’s lead to 53-47, KU managed to retake the momentum with its play in the paint. Vick kick-started the run in a fitting way with a hard take to the rim. All but two of the Jayhawks’ next 12 points came within the paint. KU grabbed its first lead of the second half when Dotson found Vick on an alley-oop at the 10:25 mark to give their team a 55-53 advantage. Six more points during this stretch saw the Kansas lead swell to 61-53 before the Cyclones could halt the surge with a pair of free throws. It wasn’t just the Jayhawk offense that was clicking on all cylinders. The KU defense held the visitors without a field goal for nearly seven minutes during that stretch which helped it take a 67-59 lead into the final 4:30 of the game. The Cyclones refused to go down without one more charge though, as a 10-2 ISU run knotted up the score. Back-to-back turnovers on KU’s end led to a pair of Cyclones triples to get the score level, with Michael Jacobson’s 3-pointer with 2:19 remaining evening things up at 69-69. Kansas responded on its next trip down with a Vick 3-pointer, a basket that ended up giving KU the lead for good. The two teams traded baskets on their next trips down the floor before Lawson connected on the final three points of his night, with a triple from the top of the key to put KU up 77-72 with 23 ticks remaining on the clock. Dotson then hit three-of-four free throws in the final 12 seconds to seal the Jayhawk victory, 80-76. Lawson was the offensive catalyst for the Jayhawks early. The Memphis, Tennessee product tallied nine of the Jayhawks’ first 11 points and helped KU keep pace with a hot-shooting Cyclone squad. ISU, which entered the night hitting a Big 12-leading 8.8 3-pointers per game, proved its prowess from deep over the opening 20 minutes. The Cyclones connected on six threes in the first frame, including a trio of triples from Horton-Tucker to help the visitors withstand several Kansas spurts. Despite Iowa State’s marksmanship from deep, Lawson and Ochai Agbaji, who connected on a pair of 3-pointers of his own in the opening half, helped the KU offense keep pace by the halftime buzzer. Lawson hit seven of his nine tries from the field and pulled down eight rebounds in the first half as KU headed to the locker room with a 42-37 deficit. KU managed only one field goal over the first four minutes after the restart. ISU used this scoring slump to push its lead to eight points, 47-39, by 3:41 into the second half. But the Jayhawks regained their footing and exploded on the 14-0 run before holding ISU off for the win. Lawson led the Jayhawks in scoring for the eighth time this season, posting 29 points on 13-of-17 shooting to go along with 15 rebounds. The performance marked his 12th double-double of the season. Garrett scored in double-figures for the third-straight game, posting 16 points. Vick and Dotson were the other two Jayhawks in double-figures, scoring 14 and 11 points, respectively.